How Has the Shepherd been Good? The church in which I was raised had a sanctuary full of stained glass windows. While it seems a little odd to find such beautiful artistic creations in a strictly Protestant church of a small town in rural Wisconsin, they were a great feature for children. During what I believed to be long, boring sermons; as a little girl in worship, I would look up to marvel at the massive colors all around. Blues and reds and greens, greys and yellows and purples blended perfectly to depict scenes from Jesus’ life. Pictures inspired by his parables. Even images of lessons he taught – like being the One that stands at the door and knocks. And being the One on a hillside teaching common folk who came hungering for a word from God – the Bread of Heaven. There was a window with children gathered round – a highly-appreciated scene for little eyes to see. ‘Cuz even if the adults typically wanted us to neither be seen nor heard, the arms of a welcoming One stretched wide to invite us all in. And then there was the window near the front of the sanctuary. It shone bright with One dressed in a rugged tunic. Far off in the countryside. Dutifully carrying home a single, little lamb. 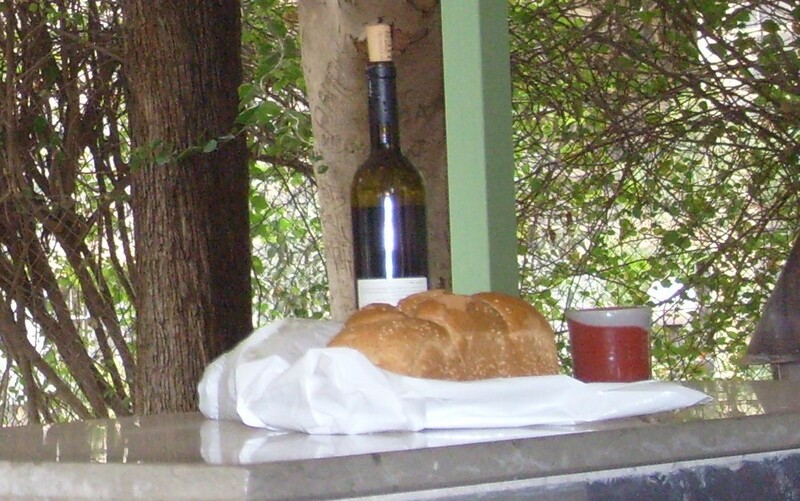 The scene drew upon the point of what some have called the counting parables of the gospel of Luke. The woman who diligently sweeps her house until she finds the lost coin. The father who patiently waits to welcome home his wayward son. The shepherd who cannot bear to leave behind one of his flock; so out he goes to find his precious, lost sheep. The fourth Sunday of Easter routinely brings us back to the image of the Shepherd. Psalm 23 is assigned by the lectionary for every fourth Sunday of Easter in the three-year cycle. “The LORD is my Shepherd, I shall not want” year A, B, and C proclaim from the Psalter (Ps. 23:1). In green pastures I can lie. Beside still waters I walk. My depleted soul, the Loving Shepherd restores. Even in the darkest valley of my life, there is no need to fear. Thou art with me. You, O LORD, deeply comfort me. My whole life long and beyond, I shall dwell with you. . . . It’s easy to see how the words of Psalm 23 just might be the most universally favored words of Holy Scripture. They speak to us in the weary-most experiences of our lives. The scariest moments of our faith – whether we are drowning in the depths of sorrow or withering in the darkest night of the soul. In the nick of time, the LORD as our Loving Shepherd grasps our hands so we will not fall. “I AM the good shepherd,” Jesus says. The One who lays down his life for the sheep (John 10:11). Each year, the lectionary pairs the beloved poetry of Psalm 23 with a portion of the tenth chapter of the gospel of John. This year, year B, the LORD as our Shepherd is paired with the equally beautiful declaration by Jesus. The Good Shepherd. Who knows his own, even as his own know the sound of his voice. In John 10:11-18, we hear Jesus distinguish the Good Shepherd from the hired hand. Though the hired hand might scatter at the first sign of fear, the Good Shepherd risks his life for his own. He will not let them go. In Feasting on the Gospels, one commentator writes: “Jesus is the good shepherd invested not in himself but in the sheep.” The commentator then asks: “What does it mean to be loved by a God whose ultimate priority is all us sheep?” (David Lower, Feasting on the Gospels, John, Vol. 2 [chapters 10-21], p. 17). . . . In the beautiful sermon called The Voice of the Shepherd, gifted preacher Barbara Brown Taylor tells of a friend who had grown up on a sheep ranch. Taylor’s friend reported to her that it was cattle ranchers who once started the rumor that sheep are dumb. Because they’re not at all like cows. Cows get herded from behind with shouts and prods from the cowboys. Taylor explains that “if you stand behind sheep making noises, they will just run around behind you. . . . Cows can be pushed; sheep must be led.” She writes: “Sheep will not go anywhere that someone else – their trusted shepherd – does not go first, to show them that everything is alright” (Nancy R. Blakely, Feasting the on the Word, Yr. B, Vol, 2; p. 450). In Christ, that’s exactly what God has done. Come into the flesh and blood of us human beings to show us everything is alright. There is a way to live in this world in trust of a Loving Shepherd who will provide and guide and come get us when we’re lost. We can relax into the grace of a God who never gives up on us. For, as Lamentations reminds: like the clean slate of a new morning, the mercies of God never end. So great is Thy faithfulness! If I were to sit down now and allow you all to finish the rest of this sermon by telling your story of how Christ has been a Good Shepherd in your own life, I wonder what each of you would say. . . . Would someone tell the story of how you were totally lost – wandering far from the ways of God; or just not all that clear in your life about what all this churchy stuff is supposed to do with the daily choices you make? Then one day, a fresh insight came about your worthiness in the eyes of God and it was as if you suddenly were found by One who whispers daily in your ear: “I love you! You are mine: precious, and honored, and beloved just for being you!” . . . Would another tell of how you lost it all – your job? Your spouse. Your child. Life seemed pointless. You were ready to give up. And then, after months or years or maybe just moments now and again; glimmers of color returned to the bleak grey of your life. Slowly you learned to begin again. Try again. Maybe even love again – despite the tender spot you feel where your heart still is mending. It wasn’t your own doing; but a Force, a Presence, a Comfort in the worst of the pain. The Shepherd gently remained at your side. . . . Someone might tell of the music that comes to mind – the words of the past that creep back in when everything else is kinda hazy. Daily memory may allude, but “Jesus Loves me This I Know” remains. “Amazing Grace, How Sweet the Sound.” Or it just might be that in the most intense moments of your fast-pace days, the sunset captures your heart and you hear: “Peace. My peace I give to you.” (John 14:27) “Do not let your hearts be troubled. Neither let them be afraid.” (John 14:1 &27). . . . Yet another among us might tell how in the dead of night, when the rest of the world is fast-asleep and your mind just will not let you fall off to the land of dreams; you sense something is with you – Someone that feels like a mighty fortress under your feet. A solid rock upon which you can stand. . . . It’s the Presence of the Good Shepherd in our lives. Feeding us. Quenching our thirst. Tending our wounds. Guiding us safely home. If I stopped this sermon right now and you had to tell of how the LORD has been your Good Shepherd, just what story might you tell? . . . In the silence of these next few moments, review your life. Listen. Remember how the Shepherd has been good to you! This entry was posted in Sermons and tagged 22 April 2018, 4th Sunday of Easter, Barbara Brown Taylor, Good Shepherd, John 10:11-18 sermon, Psalm 23, Sheep, Stained Glass Windows, The Lord is My Shepherd, The Voice of the Shepherd on April 23, 2018 by RevJule.